With the long three day Memorial weekend, we were kind of struck with what to do since we didn’t head out of town or had any big plans for the holiday. Saturday we saw the film Tomorrowland which the boys liked but I started to fall asleep during. Sunday and Monday were blank canvases until my wife mentioned a strawberry farm in Irvine. I wasn’t really that interested in strawberry picking, and if I’m being honest, I was more interested in it being in Irvine which was close to Santa Ana and a butcher I have wanted to go to. So we decided to head to Tanaka Farms with a stop afterwards at Electric City Butcher. We opted for the tour which included a ride on carts pulled by a tractor. Our tour guide explained the farm’s approach as well as showing us all of the various crops they grow. The tractor made a couple stops along the way where everyone had a chance to taste whatever was in season. For us, we tried carrots, corn, green onions, celery, and cilantro. You can really taste the freshness when it is immediately picked. The difference is amazing! Eventually we ended up at the strawberry fields where each of us had a 1 lb container to fill. What’s great about Tanaka Farms compared to some other U-Pick places we’ve been is that they actually have plenty of beautiful fruit ready to pick. It wasn’t the typical overpicked farm we usually experience. Or at least it wasn’t that way when we were there. So we came home with some beautiful, tasty strawberries that later became homemade jam, because what else are you supposed to do with 4 lbs (4 1/2 lbs to be exact) of strawberries? What I love best about experiences like this is that our boys get a chance to learn where food comes from, plus they get exposed to new food they might of passed on at the dinner table. For instance, Oscar enjoyed the green onion and probably would’ve put up quite a fight to try it if it wasn’t for it being passed around on a farm. Theo wasn’t a fan, but at least he tried the onion and some other vegetables too. We are lucky in that our boys eat a lot of fresh fruit and vegetables everyday. They eat tomatoes, green peppers, snap peas, and cut up fruit with every lunch and dinner. They’re pretty good about it with the things they’ve tried and liked. Getting them to add some new options is where the problem is. I’m guessing it’s because most of the time a parent is asking to try something new it is poorly received, so the instinct to new food is negative. That’s what’s nice about excursions like this. It’s not about us as parents asking to try something new; instead, it’s the experience that opens up experimentation. In the end, we came home with a lot of fresh strawberries that ended up in a stockpile of jam jars. Here is the recipe of for what we made. Place jars in a large stock pot covering them fully in water. Add a small splash of vinegar to avoid water from getting any film, this is definitely necessary in Southern California. Heat to a boil and then reduce to gentle boil until ready to use. In a separate pan, bring lids to a gentle boil and leave in pan until needed. Cut the strawberries to remove stems and rinse fully in water using a colander. Place the strawberries in a large pot and heat on medium-low setting. Mash the berries to your desired chunkiness. You can also gently puree them using an electric hand mixer. Though I would just use a potato masher. Mix in the sugar and lemon juice. As the berries heat, a pink bubbly film will rise to the top. Keep skimming that off with a large spoon and discard into a bowl next to your pot. After 30 minutes you should start testing. Put a small plate in the freezer and remove it after a minute or two. You’ll want to test your jam to see if it is runny. Basically, you want the jam to hold on the plate when you tilt it vertically. Continue to test until the jam doesn’t run down the plate. Remove the jars from the water and fill jars with the jam leaving about a 1/4 of an inch from the top. Remove lids from water and place on top of jars. Then seal each jar. Tighten by hand and then slightly loosen just a small amount so the jar lids are not on overly tight. They will seal properly when boiled during the final step. Submerge the closed jars of jam into water in large pots and heat to a boil. Heat in a full, rough boil for 15 minutes making sure the jars are fully covered by water. When finished, remove using jar tongs or kitchen tongs. Wipe up and moister and label the tops and date. Jam will keep for at least a year and likely longer. This is my first time contributing a recipe to the great #SundaySupper group organized by Isabel. This week’s theme is Back to School Meals. Each recipe must be easy to make in less than 30 minutes making it an easy fit for cooking at home during a school night. Well this is something I live by as the sole cook and income in our household, so coming home after a long day of work means I need to be able to make a great dinner with little time and with so many great peaches at our Farmers’ Markets here in Southern California I decided to do a simple, yet flavorful salad. Heat grill for cooking chicken breasts and peaches. In a bowl place 1/4 cup of olive oil and salt and pepper mixing together then coating boneless, skinless chicken breasts with mixture. Place chicken breasts on half of the grill. Keeping the other half of grill free for cooking peaches. Cook chicken for about 10 minutes per side being sure not to burn. Cut some ripe but not too soft peaches into halves and remove the pits. Drizzle a small amount of olive oil on the exposed inside half of the peaches. Put them non-skin side down on the grill grates and cook for 5 minutes. For the vinaigrette, mix 1/2 cup of olive oil, honey and balsamic. Whisk together and add some salt and pepper to taste. Turn the peaches over and brush with small amount of honey balsamic vinaigrette blend. Turn them a couple times cooking skin and non-skin sides for a few more minutes on each side being sure not too burn. Remove from grill. Meanwhile continue grilling chicken breasts and remove when finished. Wash lettuce and slice chicken into smaller slices laying the peach half in the center of salad and sliced chicken to the side. Sprinkle salad with crumbled feta cheese and drizzle honey vinaigrette dressing over salad. Serve with slice of bread. Hope you like it and please checkout the other recipes from the rest of the #SundaySupper food bloggers! I headed out to La Canada this morning to checkout their Saturday Farmer’s Market. There were several organic vendors offering all kinds of fruits and vegetables plus I found a source for fresh sourdough bread and a small producer of goat cheese spreads called Soledad Goats. The goat cheese spread I opted for includes black pepper and added some additional flavor to the salad I made this evening. Sorry no cooking tonight in the hotel room. Instead I opted for something quick and easy with the fresh ingredients I found. Of course this salad would be great with chicken or quinoa or both. Enjoy! Plate arugula and spoon out small scoops of goat cheese over salad. Add some fresh raspberries and gently splash balsamic vinegar over salad. My wife Stephanie kept looking into buying a VitaMix blender. We owned a perfectly fine Cruisinart blender that well blended things and quite honestly we rarely used it. So why did we need some $500 blender?! Who knows but I figured as we moved into our new home that a house warming gift was in order and well it seemed like a good time to get this crazy blender thingy. It’s been about a month since we bought the VitaMix at Costco and I have to admit – I’m addicted. Maybe it’s because I wanted to feel justified spending so much on this crazy thing. Or perhaps it just makes some great things (mainly smoothies) and is very easy to clean, making it a mostly effortless experience each time I use it. Here are a couple quick favorite smoothie recipes. The best part no added sugars and I’ve dramatically reduced my visits and cravings for Jamba Juice. Plus I can avoid any sugars or concentrates and use organic fruit. Add ingredients in order listed start on variable setting 1 and increase immediately to 10 and then put into high speed for about 30-45 seconds. I did have a disappointment on my last visit. 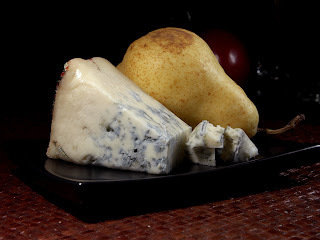 They had by far my favorite salad dressing, a Pear Gorgonzola dressing. Unfortunately, it wasn’t ordered enough so they discontinued making it. Well that got me thinking about trying to replicate their recipe. After some Googling of pear and gorgonzola salad recipes, I found a basic pear dressing recipe that I modified a bit to emulate Sweet Lorraine’s dressing. My mother in-law was over at dinner last night when I served the dressing with some fresh greens, sliced red onions and sliced carrots. She says I should bottle it. It was amazing. A four out of four stars, according to her. Everyone else really enjoyed it too, especially odd from a bunch of people who don’t like Gorgonzola. So, even if you are anti-stinky cheese, this recipe is sweet and very tasty I’m sure you’ll find it to be one of your favorite dressings too. Separate the pear halves from their juice, keep pear juice aside. In a blender or food processor, puree the drained pear halves with the lemon juice, vinegar, olive oil, salt and pepper until very smooth and silky. You may need to adjust by adding some pear juice liquid to thin the dressing or add another drained pear to thicken the dressing. Puree to desired consistency and add Gorgonzola cheese at the last moment and pulse the blender or food processor to quickly blend into dressing. Transfer to a jar, cover and refrigerate.